Becoming a big name in smartphones is not easy. Just ask Wileyfox, Panasonic and Amazon. OnePlus managed the trick, seemingly in a matter of months. It was a Harry Potter grade work of magic. How? With clever viral marketing and phones that can go head-to-head with the best from Samsung, Sony and LG but are hundreds of dollars cheaper. Let’s take a little trip into the tech time warp to remember how not-so-little OnePlus got where it is today. It was 2014. Donald Trump was just a pouting TV show host. HTC, Samsung and Sony were still fighting for the Android top spot. Heck, HTC released the all-time classic HTC One M8 that year. Then OnePlus came along. It started dropping teasers online about a new high-end phone shortly after the company formed in December 2013, along with the 'Never Settle' hashtag. No one had heard of OnePlus. Within a few months, it seemed everyone had. Everyone who visited TechRadar, gadget forums or Reddit, anyway. OnePlus whipped up a frenzy of excitement we haven’t seen since. When the phone launched in June 2014, it was so popular you couldn’t get hold of one without an invite. OnePlus handed them out online like Willy Wonka golden tickets. The best part: it was probably the best value phone of the year. The OnePlus One took the simple effectiveness of the budget Moto G series from the year before and re-framed it for the high-end buyer. It had a top-end Snapdragon 801 chipset, 3GB of RAM, a large 3,100mAh battery and a decent 13MP camera. It stacked up bizarrely well next to that year’s Samsung Galaxy S5. The camera wasn’t as good, sure, but it had a bigger screen, the same CPU and more RAM. And it started at $299/£229 (around AU$390), with a bargain $50/£40 (roughly AU$65) upgrade option for the 64GB storage model. That was around half the price of the Galaxy S5. OnePlus also introduced the 'sandstone' finish, which would be a company signature for a few years. This finish did have a tendency to rub off after a while, but it had a slightly fuzzy feel. Like a phone teddy bear. OnePlus jumped right into the annual phone release cycle right from the off. The OnePlus 2 arrived in August 2015. Re-treading the previous year’s tactic, it was teased to death online before launch. Just like most of today’s phone launches. Once again, you needed an invite to buy a OnePlus 2. They were a little easier to get hold of this time around, but it still helped if you were part of the OnePlus cult or had a friend who bought one. Thankfully, the invite system was dropped a few months after launch in December 2015, as demand leveled off to meet supply. OnePlus was no longer a mysterious outsider, but thousands of phone geeks wondered: can this company really do it again? Sure enough, it did. The OnePlus 2 felt like a higher-end phone than the original. It still had that furry sandstone finish, but the sides were magnesium alloy rather than coated plastic. The phone also added a fingerprint scanner, below the screen. Core specs-wise, OnePlus followed the trend for high-end phones of the time, upgrading to a Snapdragon 810 chipset. The big news for camera fans was OIS (optical image stabilization). This micro-tilts the rear camera to let it use longer exposure times when you shoot in low light without resulting in blurry shots. It added 'laser' focus too. This uses an IR beam to judge how far away your subject is. Like the original OnePlus, the second phone offered amazing value for money. It started at $329/£239 (around AU$440). Just a year and change on from OnePlus’s debut, it diversified its phone range. The OnePlus X was a 'budget' alternative to the OnePlus 2. It was smaller, with a 5-inch screen instead of a 5.5-inch one, and used the previous year’s Snapdragon 801 chipset rather than the 810. The OnePlus X arrived roughly three months after the OnePlus 2. In the UK it cost just £199, or $250 in the US (around AU$365). If it had the latest version of Android, we’d be pretty happy with its spec even today. The OnePlus X had glass on the front and back, anodized aluminum on its sides. We’d see this style repeated many more times by other phone makers in the years that followed. Sure, in some ways it really wasn’t a match for the OnePlus 2. Pictures from its rear sensor didn’t look nearly as good in daylight, and night shots weren’t great at all. However, that is still the case with phones at the price nowadays. Just like the OnePlus 2, the OnePlus X went on sale with an annoying invite system, but this was dropped in early 2016. The phone was discontinued in mid-2016, less than a year after its launch. In hindsight the OnePlus X was an experiment, one OnePlus hasn’t replicated since. However, it was not a failed one in our eyes. It’s likely OnePlus found the two phones split their audience rather than adding a whole new group of 'budget' buyers who couldn’t quite afford the OnePlus 2. It was all change for OnePlus in 2016. Some of its signature moves were rejected entirely with the OnePlus 3. The invite system that made the phones seem even more desirable? Dumped. The fuzzy sandstone finish? Replaced with a more familiar aluminum shell. That said, you could still get a sandstone case for it if you were a fan. The OnePlus 3 was also the first time the company teamed-up with phone networks to sell on the high street, rather than just through the OnePlus store. It sold through O2 in the UK, Elisa in Finland. The message was clear: OnePlus isn’t a startup phone maker anymore. It was finally playing the same phone game as Samsung and LG. This is a project OnePlus is still working on, though. It doesn’t have the network power of the big names yet, and in most countries is still sold direct to us buyers. You didn’t lose out too much on the value factor that made the previous phones such killer buys, either. It cost $399 in the US and £309 in the UK (around AU$565), although the price rose to £329 after the EU referendum thanks to a fall in the value of the pound. A more expensive phone might get you a higher-resolution screen, as the OnePlus 3 had (like every OnePlus) a 1080p display. However, the series continued to deliver top-end specs even though it was no longer a purely 'direct to consumer' operation. The OnePlus 3 has a Snapdragon 820 chipset, a mammoth 6GB of RAM and a 16MP camera with OIS. Many other phones had switched to using large 12MP sensors by this point, but it was still a good performer in just about all conditions. This was also the point OnePlus introduced the Dash charger. It’s based on Oppo’s excellent charge tech (Oppo and OnePlus are owned by the same company), and uses high current rather than high voltage, which makes it easier to keep charging temperatures down. 2016 was the year OnePlus got serious in a new way. And this led to the OnePlus 3T, an update to the OnePlus 3 that arrived just six months later in November 2016. This was arguably the least exciting phone the company had made. However, we did get a bump up to the Snapdragon 821 chipset, a higher-resolution 16MP front camera and a slightly larger battery. These changes do not really merit a full upgrade, though. So why did OnePlus make the move? It gave the company a chance to nudge up its prices again without turning it into a PR blunder. The OnePlus 3T sold for $439/£399 (roughly AU$730). It’s a substantial increase, particularly in the UK where the EU referendum vote had caused the pound to go into freefall. Despite the bump, the OnePlus 3T was still ultra-competitive. Samsung and HTC sold mid-range phones at this price, not ultra-high-end ones. This may not have been a particularly intriguing phone, but it was still one of the best of the year. What happened to the OnePlus 4? There wasn’t one. The number four is a homophone for the Chinese word for death. It’s considered unlucky. So we got the OnePlus 5 instead, which has a nice ring to it. It arrived just over half a year after the OnePlus 3T, in mid-2017. This marked the arrival of dual rear cameras in the series. One was a normal camera, the other a 'zoomed-in' 20MP one. There was a bit of a fuss that the zoom lens didn’t have a 2x focal length, using software trickery to get to the 'lossless 2x' claim OnePlus made at launch. This isn’t as good a zoom camera as the top iPhones. But it was a neat feature. There was a disappointing part to the camera array, though. The OnePlus 5 got rid of optical image stabilization, reducing low-light performance compared to the OnePlus 3T. Other upgrades were pretty predictable. The OnePlus 5 got the bump up to the year’s flagship Qualcomm CPU, the Snapdragon 835, and there was an option for 8GB of RAM and 128GB of storage. The price creep continued too, originally starting at $479/£449/AU$599. Remember where we started in 2014? $299/£229. Of course, other manufacturers were also increasing prices at the same time, with the Samsung Galaxy S8 costing $725/£639/AU$1,200 at launch. The OnePlus 5T was a much more obvious upgrade then the OnePlus 3T a year before. It switched the display style to an 18:9 aspect, getting rid of most of the border above and below the screen. It was a must for any phone that wanted to look current and it let OnePlus fit a 6.01-inch screen into a mobile only 1mm wider and 2mm taller than the OnePlus 5, which had a 5.5-inch display. Other than that and facial recognition, the 5T was mostly the same as the 5. There was no change to the chipset, the RAM or the camera. Even the battery stayed the same, which was a bit of an eyebrow-raiser when the display was larger. However, we found both phones lost 12% of life in our 90-minute video playback test. The extra chunk of display didn't seem to make much of a difference. 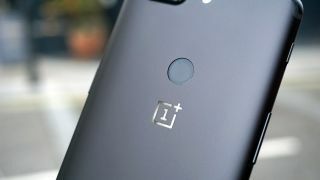 The latest OnePlus smartphone arrived in May 2018 in the form of the OnePlus 6. It sported a new glass body, the biggest screen the firm had ever put into a phone, a whole heap of power, slow motion video capture, 4K video recording and the latest Android software. The 6.28-inch full HD display features a notch at the top, although it can be 'hidden' in the settings menu, while the dual biometrics from the 5 and 5T are retained with both fingerprint and fac unlock options. This is also the first OnePlus device to come in a 256GB configuration alongside 8GB of RAM, although you can also choose from 6GB/64GB and 8GB/128GB variants if you want to spend a little bit less. The phone has experienced a small price hike over its predecessor, but the OnePlus 6 is still comfortably cheaper than its rivals from Samsung, Apple, HTC, LG and Sony.